Watch the Race in Se-pang or win cool Yamaha merchandise! You can be the lucky winner if you participate in these challenges. 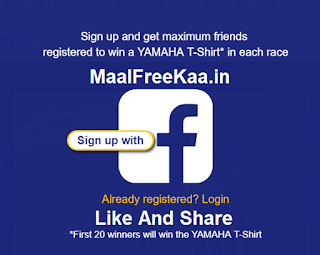 Signup and get maximum Friends Registered to win a YAMAHA T-Shirt in each race. 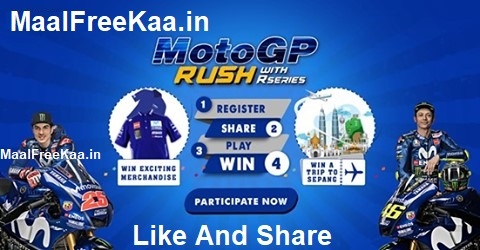 First 20 Winners will win the YAMAHA T-Shirt Register Now. MaalFreeKaa.in Online Contest, Free Sample, Giveaway, Deal, Offer No. 1 Website you can find all freebie deal and online giveaway only here. We are now Best Awarded in Publish Contest and Free Sample Website world wide. Keep Playing to win freebie prizes. All Material pertaining to Moto GP rush with R series is the property of India Yamaha Motor Pvt. Ltd. This contest is open for participants across India except for Regions where such contest participate now to get free T-shirt and win prizes. 4. The Racing Instinct : The First Top Scorers of each race who answer simple question accurately will win a Yamaha Factory Racing T-Shirt each.